Last year at this time I was fairly new to the island and desperately looking for ways to immerse myself within the culinary community. I followed Mexican related food blogs and local foodies on Facebook seeking those that loved food as much as I did. One individual I noticed was closely related to an upcoming food event in Playa del Carmen. Finally making a connection and noticing that she was the head of marketing for Taste of Playa I emailed this women asking how can I help out for this event. Hence, I became a volunteer for Playa del Carmen’s 2010 Taste of Playa. This community-oriented culinary event highlights the talents and cultural diversity of Playa del Carmen and the Rivera Maya’s restaurant network. 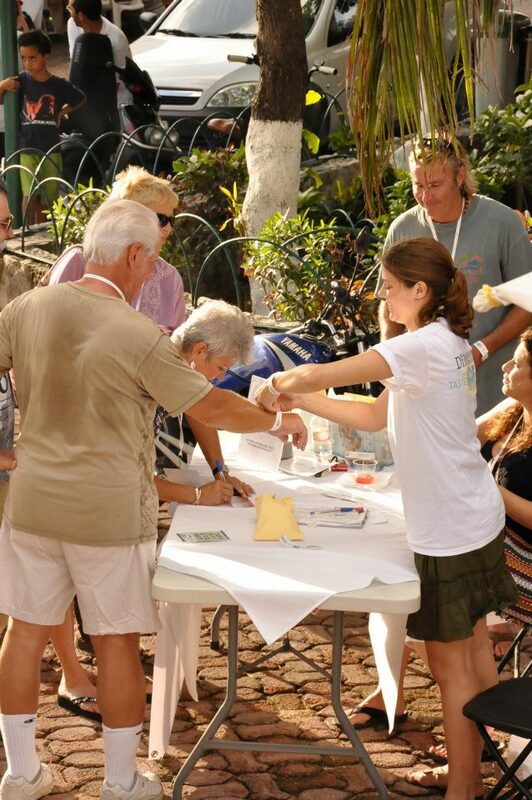 Part of the proceeds of the event benefit a local, non-profit community program (2011‘s proceeds will be given to the Rotary Club of Playa del Carmen). Since I just couldn’t get enough of last year’s event I became a volunteer again for the third annual Taste of Playa food festival this past weekend (I also must note that I purchased VIP tickets in July in anticipation of this fantastic gastronomic festival…work hard and eat hard). I took the ferry from Cozumel to Playa to help out at the VIP entrance table (Yes, I make a good bouncer coming from Jersey). This year’s event I must say was a huge success (with Diamond’s International as a major sponsor) ! The whole event was planned and coordinated spectacularly minding the turnout of last year’s event. Congratulations to the committee who planned and executed this years event. Locals and tourist alike turned out in numbers to sample some tasty delights. Global and local, you name it every taste was satisfied. Over 40 restaurants participated which included local taquerias, bakeries, fine dining establishments and more! Some pleasant surprises and delights that I went back for second helpings….Chez Celine my beloved French bakery where I met Jasques Pepin for coffee and Curry Omm that satisfies my international cuisine cravings when I am tired of Mexican food. Taste of Playa not only benefits the community in terms of donating to a charity, it also gives face time for the “little unknown” restaurants (eh hem…Curry Omm). I smiled when I over heard someone say “did you know there is an Indian Restaurant in Playa?” Yes I did my friends and I hope this brings good business to one of my favorite places to eat. If you are interested in helping out next year, just let me know. Email me and I can get you in touch with the right people. I just can’t wait to get another bite of 2012’s Taste of Playa! Great to see you again this weekend! Shall we make it an annual thing!!! Kidding…I hope I see you way before taste of Playa 2012!! Michele in Playa – It was wonderful to see you too! Definately look forward to next years event, but yes, let’s see each other before then. If Curry Omm is so good, why is there never anyone eating there ? I’ve wanted to go since it opened but have been wary due to their lack of business. Curry Omm is wonderful! The folks that are on the committee of Taste of Playa agree too. They actually introduced me to the restaurant a while back. I have brought friends from Cozumel over to eat. It’s a tiny place so yes, you may not see anyone in there (note: they do quite a bit of take-out too). Additionally, they are kind of “off-the-beaten” path from 5th Ave and the Sr. Frogs crowd. Give it a try. FYI if you like it hot….they can make it HOT! Thank you for your kind words, Taste of Playa was a wonderful experience for us, though a lot of hard work goes behind the scenes.. We have a new menu coming out soon, with a lot more choices so people can come back more often and try something new; We finally have a good supplier for spring lamb and if you’ve tried this in the past, it’s a very popular dish… Come back and see us soon at Curry Omm. Curry Omm – Glad to see you this year! So much for retirement 😉 Keep that lamb coming! And keep it spicy!! Mark, thank you for your comment, I agree to the extent that we are quite during the day and our lunch time flow is low, we are located well away from 5th Ave and hence people flow is low too! Evenings are much busier. We are still relatively new in Playa and Taste of Playa was our first real marketing exercise; we’ve survived well for an “empty” place, otherwise we would have closed down a long time ago!